The raid took place so quickly and brutally that they didn’t have time to gather their clothes, their tools, their plates and cups, in some cases, not even their IDs. Shanty houses were demolished. Their possessions were destroyed. They are perpetual victims of a State which sends them onto the streets, denies them decent housing – or housing at all – runs them off the land without their belongings so they end up under the bridges. It was Saturday, August 23rd at 8 a.m. when they entered Cruz and Pola streets. Carmen was getting ready for bed, having taken guard duty from 3:30-7:30 a.m. “We do guard duty to protect our things, because otherwise they steal from us,” said Carmen. She hadn’t yet closed her eyes when she heard the noise. Her children began to cry as the house shook from the blows. 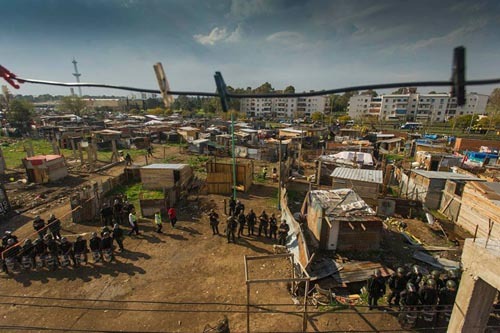 They were a little over 300 people, of the 500,000 living in makeshift housing in the Autonomous City of Buenos Aires. Buenos Aires is the most beautiful and wealthiest city in Argentina, not to mention the most European. However, the city frays and languishes to the south. Two and a half million people live in sub-standard conditions if we include the periphery of the city. Many of these more than 300 people will join the other 2,000 who, if they are lucky, will find shelter under the nearby freeways. Or in the shells of buildings left half-constructed by successive economic crises. Or in empty houses. 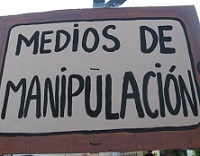 Or on pavements in the shining center of Buenos Aires, where the thundering noise of inequality stunts intelligence. The city’s population has decreased in the last ten years. But those crammed into slums (villas) and settlements have doubled in number. And they are three times as many as in 1991. 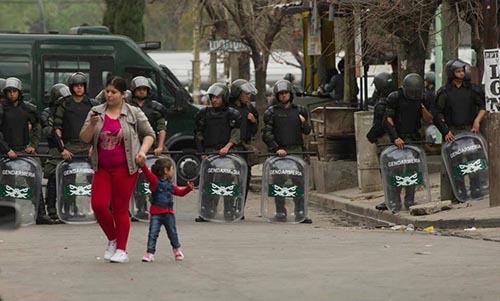 The right-wing ruling party of this most European of Argentine cities, called “Pro”, segregates its excess population. They are confined to 42 settlements and villas, 21 impoverished neighborhoods, 172 occupied buildings or squats, subsidized hotels (3,300 families), 21 housing tenements, etc. The budget has been repeatedly cut as if by a blind man with scissors: in 2006, the housing budget was equivalent to 5.3 percent of the total. By 2014, this had fallen to 2.5 percent. Whereas, in 2006, the villas received 2.5 percent of the budget, by 2013 it was barely 0.8 percent. There is a systematic neglect, or eradication, of housing budgets. Saturday night found them on the peripheries of the settlement, which had already been cleared. 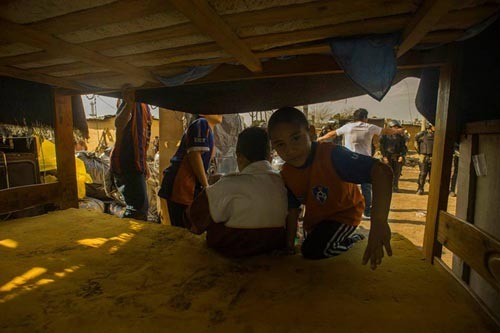 Entire families – or shattered ones – tried to resist, surrounded by their children; their mattresses, their life stories in plastic bags, their identities buried amid the debris of the bulldozer. As they sought cover under rags or tarpaulins, they were surprised by the storm, which chose this of all nights to unleash its pitiless fury. Rain and hailstones fell from the sky like another repressive force. As if it hadn’t been enough with the Federal Police, the Metropolitan Police and the Gendarmerie, the sky also beat them over the heads and froze their souls. Seven months earlier, they had constructed their little homes upon this poisoned land, which neighbors the Villa 20. They appeared quietly and seemingly out of nowhere on February 24, and occupied the plot of land in Fernández de la Cruz and Pola streets. They divided their individual plots by eye, they drew out markings with the toe of a shoe, nailed pieces of wood together and covered them with nylon. Then, some metallic sheets; until during the recent months some small houses were built with concrete blocks. 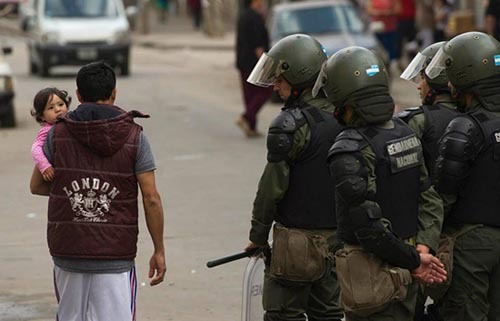 The authorities wanted to evict them from the first day, but the Metropolitan and Federal Police Forces were unable to reach an agreement. The murder of an 18-year-old girl put an end to speculations; her blood was the perfect excuse to clear the people, the majority of whom don’t sell drugs, don’t steal, don’t attack anyone, don’t murder, and are always victims of one or other group. The raid took place so quickly and brutally that they didn’t have time to gather their clothes, their tools, their plates and cups, in some cases, not even their IDs. Shanty houses were demolished. Their possessions were destroyed. They are perpetual victims of a State which sends them onto the streets, denies them decent housing – or housing at all – runs them off the land without their belongings so they end up under the bridges. They will also be kicked out from there until they find another piece of land, and along with hundreds of others just like them, will reconstruct their homes of wood and plastic and go to sleep under a nylon sky. The neighbors say political brokers exploit the desperation. They seize the land in practice, encourage people to move out, and sell them plots of land owned by no one. Or they build shanty houses and then rent them out. Carmen used to pay USD$200 to rent in Villa 20, while in Villa 31 it costs up to USD$300 USD. In the polluted neighborhood of Lugano, a piece of land costs over USD$1,250. The terrain where the Villa 20 occupies has its history: In the 1980s, the federal authorities bought the area from the city to be used for dumping cars seized by the police. The Villa 20 grew significantly over the next 30 years and started to encroach on the junkyard. People took car parts to sell and to use in the construction of their homes. In 2006, the city was pressured to make a decision. A high level of contamination was an inevitable consequence of people living side by side with scrapped cars. It also made impossible the installation of the drinking water network, due to the discharge of toxic liquids into the water table. Children aged from 2 to 5 years of age were found to have lead in their bloodstream due to playing in close proximity to the cars, while their metabolisms were damaged by the presence of metals and asbestos (used in brake pads), a cancer-causing substance banned in the European Union over ten years ago. The land and water table are contaminated with cadmium, zinc, copper, chrome, magnesium, nickel, selenium and hydrocarbons. 13.5 percent of children exhibit stunted development, while 15 percent have language disorders. The city government continuously fails to comply with Law 1770 – the restructuring and urbanization of Villa 20 – sanctioned by the Legislature during the administration of Mayor Aníbal Ibarra. Yet neither he nor his successors Jorge Telerman and Mauricio Macri (from the ruling Pro Party) fulfilled their obligations. But the judicial authorities did not evict them. For those who lack even somewhere to rest their bodies, the authorities send the Federal Police, the Metropolitan Police and the National Gendarmerie. Meanwhile, Argentina’s most beautiful, most European and most unequal city has had a construction surge of luxury buildings (almost 27 percent of apartments are uninhabited). It is a stark contrast to the senseless reality of houses made of sticks, at the mercy of southerly winds, rain and hail. Ana and Carmen, dead cold and alone, define themselves with a language colonized by the system: “We are in a street situation, we have nowhere else to go.” That little patch of land, which was called “Pope Francis,” and had been blessed during a mass with people’s feet on corrupted land, gave them some hope of a permanent dwelling. But by Saturday, God had already closed his office. Photos by Carlos Brigo. Translation edited by Nancy Piñeiro.